Summary: The purpose of the proposed study is to investigate the movements and migrations of Kemp?s ridley turtles inhabiting the Charlotte Harbor National Estuary. In-water tagging efforts have identified a locality in Pine Island Sound as foraging habitat for Kemp?s ridleys, but it is not known to what extent turtles use the entire estuarine system for foraging and whether turtles in these relatively warmer waters exhibit seasonal migratory patterns. Kemp?s ridleys will be captured via strike netting in this area of aggregation, transported to a shoreside facility for satellite transmitter attachment, and then released near the capture site. The resulting locational data will be analyzed to identify foraging areas for Kemp?s ridleys in the estuary and surrounding waters, characterize their migrations relative to environmental conditions, establish migratory pathways/corridors in the eastern Gulf, and explore the connectivity among foraging grounds and marine protected areas. Additionally, knowing where these turtles are feeding will aid in interpreting their isotopic signatures in an ongoing trophic ecology study. 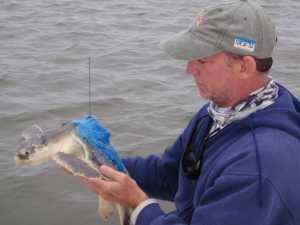 The proposed study will provide scientific data needed by state and federal agencies to effectively manage and conserve Kemp?s ridley turtles and their foraging habitat. Results: Satellite tracking durations increased for Kemp’s ridleys released later in the winter of 2012 and then decreased for those released during the spring of 2013. The trend appeared to be related to the ambient water temperature experienced by the instrumented turtles and transmitter malfunction is suspected rather than behavioral differences among turtles. The shortest durations occurred at the beginning (LK1 and LK2 in September) and end (LK9 and LK10 in April) of the tracking period when water temperatures in Pine Island Sound were around 29º C and 27º C, respectively. Longer durations were observed for turtles released in October and November when water temperatures had decreased to 25º C in the sound and continued to decrease through these tracking intervals. Poor transmitter performance is further supported by the fact that tracking durations for Kemp’s ridleys reported herein (47 ± 33 days, n = 10) were significantly shorter (t = 3.21, p = 0.004) than turtles tracked the previous year (110 ± 34 days, n = 4) using the same manufacturer and model of transmitter.